Companies building CNC machines incorporating rotary axes would normally need to source and assemble a torque motor, a precision bearing and a high resolution angle encoder. All three items may now be purchased from Heidenhain as a single, compact unit following the company’s introduction of two new modules, designated SRP 5080 and SRP 5010, fitted with an incremental and an absolute encoder respectively. Both can provide an all-in-one system for controlling rotary and tilting motions to within 2.5 seconds of arc and feeding the position back to a CNC system. Typical applications are on 4-axis and 5-axis machine tools, metrology stations, articulated joints and other equipment where smooth and precise rotary positioning is essential, such as in semiconductor and electronic component manufacture. The modules are a realistic alternative to air bearing axes, especially as the motor has a very low detent torque so there is no discernible cogging. 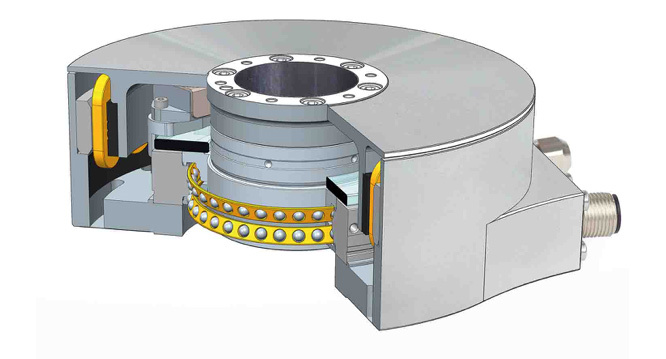 Since Heidenhain manufactures the roller bearing and the encoder, they are highly compatible, require fewer components than conventional solutions and permit a rigid, low profile design. Available with a 35 or 100 mm diameter hollow shaft, the modules significantly reduce installation and calibration times, as matching the individual components to each other as well as to the machine environment is not necessary, nor is time-consuming testing. With an axial load capacity of 200 N, the SRP 5080 and SRP 5010 have low and consistent frictional torque below 0.2 Nm, promoting smooth motion at up to 3,000 rpm. Axial guideway accuracy of the bearing is better than ± 0.02 micron, while in the radial direction 0.02 micron accuracy is exceeded, even under changing loads and varying operating temperatures from 0 to 50°C. Customer-specific modifications are possible for perfect adaptation to individual requirements. Particularly good dynamic performance and positional stability are provided if AccurET position controllers from ETEL are used. The Swiss company, part of the Heidenhain group, also manufactures the motor used in SRP-series modules. HEIDENHAIN angle encoder modules with integrated bearing and drive provide very high accuracy rotary motion in a compact unit.